In Cambodia, land and natural resources occupy a central place in the production systems of peasants who represent about 80 percent of the country’s population. The development and governance of socio-ecological systems trigger considerable economic, social and environmental issues that need to be addressed urgently given the profound nature of the transformations at play in these systems across Cambodia. Against the background of Cambodian peasant conceptions of, and approaches towards, land tenure security, this document presents the historical evolution of, and current challenges presented by, various land reforms that have attempted to formalize the land property rights system in the Kingdom. 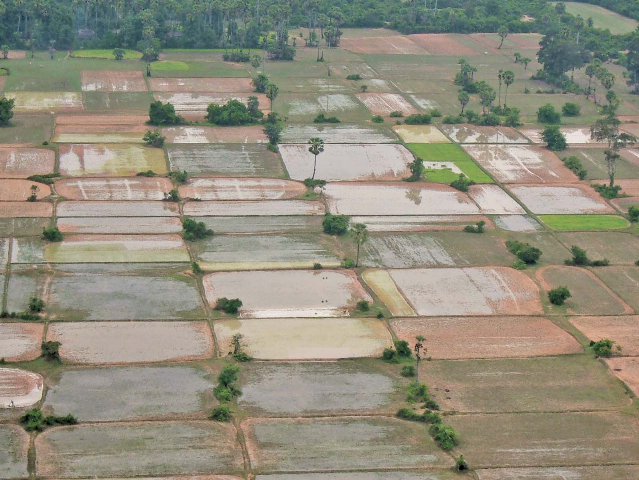 It suggests that current land tenure regimes in Cambodia are highly fragmented between lowland central plains and peripheral uplands, which has yielded problematic results. Finally, the attempts by the government to address the ensuing contradictions are analysed. Current land tenure regimes in Cambodia are highly fragmented between lowland central plains and peripheral uplands. This fragmentation has yielded contradictory and problematic results. In the lowland areas, the current trends to modernize land property rights through land titling and the promotion of land markets is quite at odds with the historically rooted institutions of peasants to appropriate land “by the plough” and to seek land security of tenure predominantly through recognition of possession rights legitimized by local authorities through local institutions. We have argued that land titling has not radically changed the security of tenure in the central plains, and that the uncontrolled recourse to market for land transactions has exacerbated the private enclosure of land and disembedded land from its social fabric. In the uplands, land reforms have been mostly implemented in a context of post-war political economy fuelled by the extraction of natural resources. The allocation of forest concessions and later of agro-industrial concessions by the state has overwritten local land management rules and institutions and has considerably undermined the security of peasants’ land tenure. Furthermore, the existing state land management instruments, such as Social Land Concessions, communal land titling or forestry/fisheries resources co-management, are far too weak to really address the power issues at stake in these upland areas. This fragmentation is actually sealed in the 2001 Land Law, which restricts legal land possession to land occupied before 2001. In a context of high demographic increase and limited opportunity to intensify production, these legal dispositions have marginalized the peasant population who are expanding their land-holdings. A central shortcoming of the current land reform is its failure to articulate the processes of land rights formalization in lowland and upland areas, although both regions are closely linked through land-driven migration movements that have intensified over the past 20 years. These migratory movements have contributed to a significant redistribution of the rural population between lowland and uplands. In a parallel process, and driven by strong state-based political economy, large land deals have been concentrated in the uplands of the entire country along processes that are exclusionary in nature. It is against the rapid changes unleashed by these ELCs that we present the ineffectiveness of other land tenure regimes that are part of state land management in the uplands. Indeed, the incompleteness of the land titling process has left large areas untitled and has created new forms of land tenure fragmentation in the uplands that are not being addressed. In order for land access for peasants to be more secure, greater attention should perhaps be given to articulating different land tenure regimes in ways that bring peasant movements and migration back to the centre of the debate. This working paper is a part of a research undertaken in partnership with AgroParisTech (UFR Agriculture Comparée et Développement Agricole/UMR Prodig, Hubert Cochet and Olivier Ducourtieux), the association “Améliorer la Gouvernance de la Terre, de l’Eau et des Ressources naturelles” (AGTER) and the author.